Landscapes that have been degraded mean a reduction in the availability of resources which affects the metabolic rate of the honey bee and puts more strain on its body's ability to function. Emeritus Professor Don Bradshaw from UWA's School of Biological Sciences said the researchers wanted to find out how honey bees' metabolism was impacted by human made changes to the environment such as clearing of land. 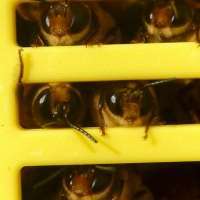 "Before conducting the experiment we thought the bees would have a much higher metabolism in degraded areas because they would need to travel further in search of food," Professor Bradshaw said. "We were also able to measure their intake of nectar which showed that the bees in the degraded landscape were feeding less." The research has important implications for understanding environmental impacts on bees which will help preserve bee populations in the future and may offer insight into the way other insects' metabolism works and how it affects their behaviour. This is the first time the metabolic rate and feeding rate of a free-flying insect has been measured in its natural environment and paves the way for future research on pollinators other than bees. The Creator had thought of everything. Human beings can mostly only think of themselves in this fallen world. Too much struggling just to survive forces them to take short cuts to income. Mostly with bad outcomes for the environment and their fellow human beings. Bees, birds and crawling insects are the most underrated of companions on earth. This is clearly seen now with the rapid disastrous decline in bee populations. May the Lord grant us mercy to quickly find solutions to these and other problems.